President Akufo-Addo has appealed to all sons and daughters of Dagbon to unite behind the new Ya Na, Mahama Abukari II, describing him as a man of experience and dignity who will discharge the duties of his new office with distinction. Speaking at the enskinment and outdooring ceremony of the new Ya Na at the Gbewaa Palace, in Yendi, on Friday, he urged all to give Ya Na Mahama Abukari II all the support he requires. “Naa, I know you are a man of peace and unity. I know, from a few decisions you have taken since your selection as Ya Naa, you are a man of reconciliation. I believe you are the man to reconcile Dagbon, and blunt the age-old rivalry of Abudu versus Andani, and put Dagbon back on the path to sustained progress and prosperity, as was envisaged by one of the greatest figures in the history of Dagbon, the 18th Ya-Naa, Naa Zangina,” the President said. Describing the enskinment as “a truly historic ceremony”, President Akufo-Addo stated that the ceremony should put paid to a long struggle, over several decades, for the namship of Dagbon, which has brought in its wake death, destruction and retrogression of the Dagbon State. In admonishing citizens of Dagbon, President Akufo-Addo urged them to bear in mind that there would be a small minority who will not be happy with the new status quo. He explained that there are a handful of malcontents who have benefited, for a long time, from the conflict, and never wanted to see its end. “We are not to rest on our oars and assume that every citizen of Dagbon is elated about the new peace and the enskinment of a new Yaa-Na. Indeed, there is a new term for people who profit from conflict. 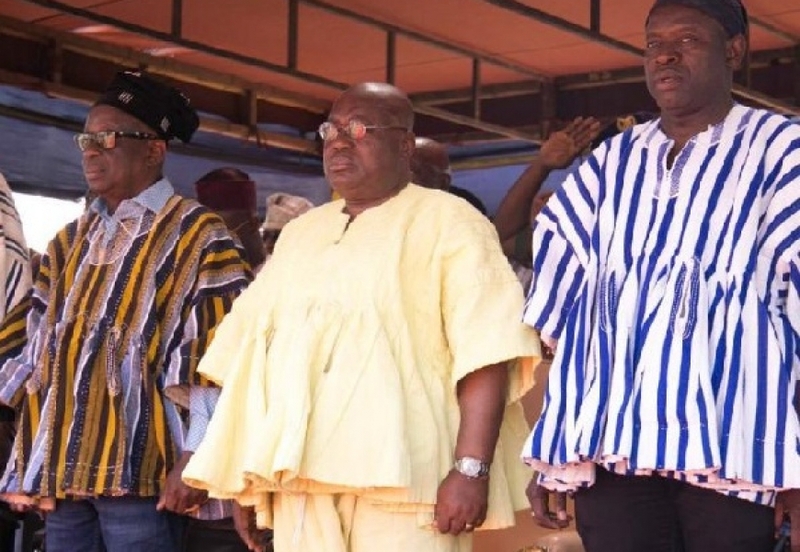 They are called, “conflict-preneurs.” We have to be resolute in warding off such people by strengthening the process of reconciliation amongst the people of Dagbon,” the President said. He continued, “We are not to fear the strategy of our enemies, but our own mistakes. Dagbon does not have to fear an external enemy. Dagbon is a great state, one of the most ancient traditional states of our history. He announced that Cabinet, last week, approved a $30 million water supply project that will replace the old and dilapidated water system in Yendi and its catchment area. “My Government is working to put in place the infrastructure that will allow us to exploit the iron ore deposits in Sheini. On the back of that exploitation, we shall put a railway line to run from Accra through the Volta Region and the new Oti Region and through Yendi to Burkina Faso,” the President added. To the new Yaa-Na, President Akufo-Addo made a commitment to him, stating that he do everything in his power, as President of the Republic, to assist him to administer the State of Dagbon in an atmosphere of peace and tranquillity. “As I have said before, I am neither Abudu nor Andani, I am an ‘Abudani’, a person who stands for unity, reconciliation and progress in Dagbon,” he added. The President congratulated, again, the Committee of Eminent Chiefs brilliantly chaired by the Asantehene, Otumfuo Osei Tutu II, together with the Overlord of Mamprugu, the Nayiri, Naa Bohugu Abdulai MahamiSheriga, and the Overlord of the Gonja State, the Yagbonwura, Tuntumba Boresa Sulemana Jakpa, for their untiring efforts in bringing us this far. The President was hopeful and expectant that the new Yaa-Na will move quickly to accord Yakubu Abdulai Andani, formerly the Kampakuya Na, and Abdulai Mahamadu, formerly the Bolin Lana their rightful positions in the State of Dagbon to seal the process of reconciliation.